For two years, a waste pickers’ cooperative in Pune had been trying to draw the attention of sanitary napkin makers towards the woes of waste pickers, who segregate and dispose of municipal waste, including soiled napkins. Having failed, it took a desperate, unconventional step on March 8. 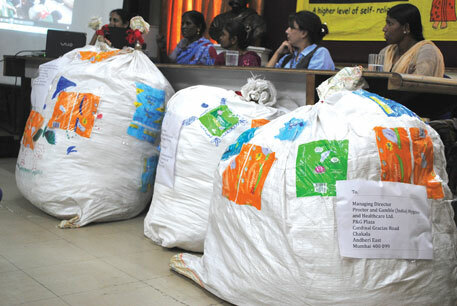 Swach Pune Seva Sahakari Sanstha Maryadit (also known as Solid Waste Collection and Handling, or SWaCH) sent bagfuls of soiled sanitary napkins to the corporate offices of top feminine hygiene product manufacturers, Procter and Gamble, Hindustan Unilever, Johnson and Johnson, and Kimberly Clark Lever. 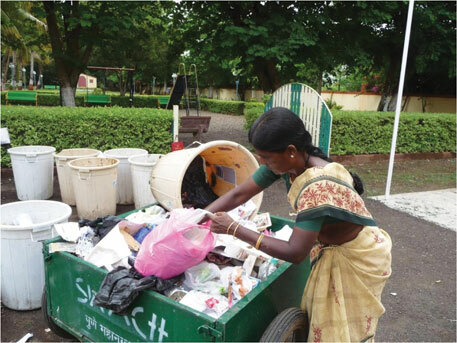 “SWaCH took the drastic step so that they too understand what it is like for waste pickers to handle such waste,” says Manisha Desai, a member of the organisation. SWaCH had repeatedly sent letters and emails to the companies, informing them of the plight of waste pickers and requesting meetings to discuss proper disposal of sanitary napkins, says Desai. But their pleas went unheeded. The Plastic Waste (Management and Handling) Rules, 2011, include certain provisions of Extended Producer’s Responsibility (EPR). These provisions make producers responsible for the end of life of the products and the financing and organising of an environmentally sound system for the management of waste generated from the products. Stree Mukti Sanghatana (SMS), a Mumbai-based non-profit, in letters to the firms, suggested including a disposable, biodegradable bag with each pack of sanitary napkins and diapers as part of the companies’ EPR. Jyoti Mhapsekar, president of SMS, says there was no reply from the companies. The Central Pollution Control Board (CPCB) has classified sanitary napkins as municipal solid waste. According to the Municipal Solid Waste (Management and Handling) Rules, 2000, soiled napkins, diapers, blood-soaked cotton and condoms are considered household waste, and are disposed of after segregation into biodegradable and non-biodegradable components. However, items contaminated with blood and body fluids, including cotton, dressings, soiled plaster casts, lines and bedding, are considered bio-medical waste and under the Bio-Medical Waste (Management and Handling) Rules, 1998, should be incinerated, autoclaved or microwaved to destroy pathogens. In their letters, both SWaCH and SMS explained that handling soiled sanitary napkins exposes waste pickers to disease-causing microorganisms E coli, Salmonella, Staphylococcus, HIV and pathogens that cause hepatitis and tetanus. “Waste pickers are vulnerable to such infections as they are exposed to viruses thriving in soiled sanitary napkins that are not disposed of properly,” says A C Banerjea, chief of laboratory of virology at the National Institute of Immunology, New Delhi. 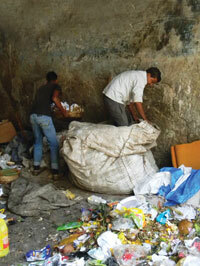 Waste pickers, most of whom work without any protective gear, are aware of the hazards. “It is our job to pick other people’s dirt. At times we have to pick worm-infested rotten kitchen waste. It does not worry us. What worry us are bloodied cotton, sanitary napkins and bandages. We often cut ourselves with broken glass and sharp pieces of metal in the waste we handle. We may be illiterate but we know that such waste can make us sick and it scares us,” says Mina, a waste picker in West Vinod Nagar, East Delhi. The sheer number of soiled sanitary napkins discarded with general household waste every day adds to the burden of the environment. A survey conducted in 2011 by market research group AC Nielsen, titled ‘Sanitary protection: Every woman’s health right’, showed that at 12 per cent, India has one of the lowest sanitary napkin usage figures in the world. The figure is 100 per cent in Japan and Singapore, 64 per cent in China and 88 per cent in Indonesia. Estimating that 300 million women in India are of 15-54 years of age, a sanitary napkin usage of 12 per cent implies that 36 million women use sanitary napkins every month. At an average usage of 12 napkins per woman per month, this would add up to 432 million soiled pads, weighing a staggering 9,000 mega tonnes, enough to cover a landfill spread over 24 hectares. More than 90 per cent of a sanitary napkin is made of crude oil plastic; the rest is made of chlorine-bleached wood or cotton pulp. Under the Municipal Solid Wastes (Management and Handling) Rules of 2000, soiled napkins are considered part of non-recyclable household waste and are to be incinerated. The informal practice of burning soiled napkins in the open releases toxic gases like dioxins and furans. But most napkins end up in landfills because waste pickers are too put off by the waste to handle them. Neither method is a safe or sustainable way to dispose of soiled napkins. “Due to the heavy use of polymers, the products are non-biodegradable and non-recyclable. They pose severe environmental threats,” says Lakshmi Narayan, general secretary of Kagad Kach Patra Kashtakari Panchayat, a waste pickers’ union in Pune. In January, sanitary napkin manufacturers were invited to a consultation by Pune Mayor Vaishali Bankar and commissioner of Pune Municipal Corporation (PMC), Mahesh Pathak. The companies once again did not respond. After the protest staged by SWaCH on March 8, representatives from Feminine and Infant Hygiene Association (FIHA) called a meeting on April 3 with SWaCH, two other Pune-based non-profits Parisar and Janwani, and PMC. FIHA is an organisation of small-, medium- and large-scale industries involved in feminine and infant hygiene products. Hindustan Unilever, Procter and Gamble Johnson and Johnson, and Kimberly Clark Lever are its members, says Rajesh Shah, president of the association. At the meeting, joint commissioner of the solid waste management department of PMC, Suresh Jagtap, explained that the burden of handling and processing post-consumer waste is being borne by waste pickers and the municipality. He asked FIHA members to develop disposal alternatives so that waste pickers do not have to handle such waste. He also requested manufacturers of sanitary products to develop a proposal with concrete steps for disposal of the soiled items. This is to be presented at a consultation meet led by T C Benjamin, additional chief secretary of public health department, Maharashtra, in Mumbai in May. With no means for safe disposal, most women hide soiled napkins in newspaper or polythene bags in corners of the bathroom or storeroom, and discard them outdoors or in a garbage dump. Rama Sharma, a Delhi home-maker, was horrified to find her five-year-old son emptying a bag of soiled napkins hidden under the toilet cistern. “I washed his hands with antiseptic, but I was really scared. There are so many germs in used sanitary napkins. I have started throwing pads in the drain outside our house,” she says. Soiled sanitary napkins create major problems for the drainage system of cities, says Jagtap. “Used sanitary napkins and condoms clog sewage pipelines and hinder the proper flow of waste water. We are planning to install dedicated incinerators in wards within PMC limits,” he says. A recent survey conducted by PMC and non-profit Bharatiya Shree Shikshan Jagran (BSSJ) found as many as 0.25 million used sanitary napkins are discarded in Pune every day. They either choke drainage pipelines or litter footpaths. This is true for any city in India. Kamla Devi, a 55-year-old waste picker who works in a residential colony in Kalkaji, Delhi, was angry to find that someone had tucked a bag of napkins under a concrete slab, only for it to be pulled out and scattered on the road by a dog. “Why do they do this? As it is we have to open each and every bag and segregate waste before putting it in the corporation truck. Now I will have to collect all this in front of all the men passing by. Have I no honour just because I am a waste picker?” she says. The survey also indicated that 63 per cent of women do not have any provision for disposing of sanitary napkins at their workplaces. A similar survey by Bangalore Water Supply and Sewerage Board (BSSWB) found that the main reason sanitary napkins are flushed down toilets is that women feel uneasy disposing of them in garbage bins. A Delhi-based firm, Washroom Hygiene Concepts, installs and maintains units designed for the disposal of used sanitary towels and tampons. The units can be installed in the washrooms of offices, schools and other institutions. “The key factor is that soiled sanitary napkins are disinfected in the unit. Employees collect the discarded napkins and the waste is incinerated,” says Sudha Chakrapani of the firm. A more sustainable solution would be to manufacture biodegradable or recyclable sanitary napkins. In 2007, Amita Malik of Delhi-based Shriram Institute for Industrial Research developed a technology that uses bamboo pulp in the manufacture of sanitary pads. Bamboo pulp can be composted, is 300 per cent more absorbent and safer than wood pulp. This is a pilot project and the product is not yet being mass manufactured. In 2012, a research group from IIT Madras started to develop a biodegradable sanitary napkin, without the outer casing of non-woven plastic. Another start-up enterprise, Azadi, claims to have developed a 100 per cent biodegradable, low-cost sanitary napkin. With increasing consumer awareness, biodegradable or recyclable sanitary napkins, coupled with an efficient disposal system, could go a long way in reducing the burden on waste pickers as well as the environment. Good job bringing this to light. People won't realise how huge the problem is and municipalities are woefully ill equipped to deal with the issue. How many municipalities have incinerators for instance? What a story! Quite an eyeopener..Great job Soma. Good story. This issue was on the fringes for years. What an eye opener! As an environmental engineer,disposal of sanitary napkins has always been a concern during waste management practices that I follow. Hope these companies come out with a solution soon. Wow, very interesting article ! I learned a lot, thank you Soma ! Instead of napkins and tampons, there is a very handy solution which sadly gets no publicity, the menstrual cup. It is a reusable silicon cup that a woman inserts within and reuses after a simple rinse. A cup can be reused safely for about ten years! Nothing goes into the dustbin. It is a very eco-friendly solution. People really these sanitary napkins have become a great disaster to our women and even our mother earth. Kicking off this disaster has become a major issue. Its 21st century and for our future generations we must leave something good something RUSTIC something HEALTHY for our women. Very beneficial alternative which fights against all ill effects of these sanitary napkins can be "SILICON CUPS". If anyone interested to fights against these disasters and use REUSABLE and HEALTY silicon CUPS can contact me.